President Moon Jae-in has consistently stressed the need for dialog to resolve tensions on the Korean Peninsula and to open a new era of peace. North Korea and the United States have responded to his determination and sincerity, and peace overtures around the 2018 PyeongChang Winter Olympics have led to a dramatic thaw in relations. North Korea’s additional pledges to dismantle its Punggye-ri Nuclear Test Site in public view and to change its time zone to match that of South Korea were implemented in May 2018. On May 26, 2018, the South Korean and North Korean leaders met again at Tongilgak on the northern side of Panmunjeom. Their second summit called for cooperative efforts to implement the Panmunjeom Declaration and to successfully hold the planned North Korea – US summit. The two leaders also reaffirmed their commitment to meet at any time and any place if the need arose. The 2018 Inter-Korean Summit was a watershed moment for denuclearization and peace on the Korean Peninsula as well as the advancement of inter-Korean relations. 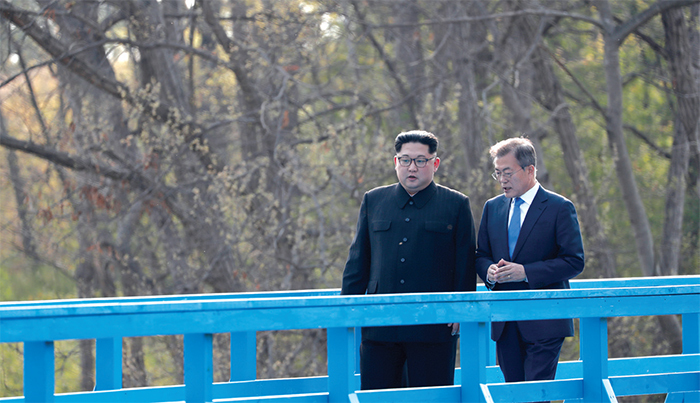 Their severed ties have been reconnected, and Panmunjeom, which had been a symbol of division, has become a symbol of peace. In addition, the successful inter-Korean summit laid the groundwork for the first North Korea – US summit held in Singapore on June 12, 2018. The back-to-back summits between the leaders of the two Koreas as well as the leaders of the United States and North Korea became milestones toward the peaceful resolution of North Korean nuclear issues and peace on the Korean Peninsula, a goal fully shared by the international community. President Moon Jae-in’s policy on the Korean Peninsula is a long-term and comprehensive policy led by South Korea and North Korea to realize “peace” and “prosperity” on the Korean Peninsula, with the involvement of neighboring Northeast Asian countries together with international society. The policy aims to establish sustainable inter-Korean relations and to pursue coprosperity on the Korean Peninsula and in Northeast Asia by upholding peace as the highest value and promoting a spirit of mutual respect. 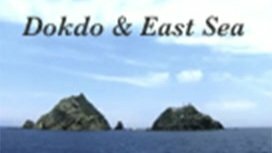 With Japan’s surrender in the Pacific War in August 1945 four decades of Japanese colonial rule ended and U.S. and Soviet troops came to be stationed on the Korean Peninsula to both the south and north of the 38th parallel respectively. This resulted in the division of Korea into two separate countries. On June 25, 1950, North Korea attacked the South on all fronts, igniting a three-year internecine war. The tragic war was stopped with the signing of the Korean Armistice Agreement on July 27, 1953. The peninsula has remained divided ever since, but a mood for peace has recently developed after years of tension. Between September 1990 and October 1992, the two Koreas engaged in a total of eight bilateral meetings, including the first High-Level Talks held in Seoul. In December 1991, the two sides signed the Agreement on Reconciliation, Nonaggression, and Exchanges and Cooperation between the South and the North (also called the Inter-Korean Basic Agreement). The agreement was focused on mutual respect between the two nations, the renunciation of armed aggression, exchange and cooperation in many sectors, and the guarantee of free exchange of people between the two countries. From the mid-1990s onward, the South’s government continued to provide support to the North, which was continuing to experience serious economic difficulties. In the period 1999-2007, the South supplied a total of 2.55 million tons of fertilizers to the North in an effort to help the North Korean people who were suffering from a food shortage caused by the inefficiency of the North’s farming system and a lack of fertilizers and chemicals. Such assistance was later suspended due to North Korea’s nuclear tests and other provocations, but humanitarian aid through private organizations was resumed in 2015. The Inter-Korean Summits held in 2000 and 2007 provided the momentum for a dramatic invigoration of dialogue, exchange, and cooperation between the two sides. However, the South temporarily suspended the supply of food and fertilizers after the North’s continuing series of provocative actions culminated in the launch of long-range missiles and nuclear tests, but did not stop providing humanitarian support for children or emergency relief aid. The deployment of the Terminal High Altitude Area Defense (THAAD) system in South Korea has led to some instability in the relations between neighboring powers (United States, China, Japan, and Russia). However, the Moon Jae-in administration has made aggressive efforts toward peace. In September 2017, the Moon government deliberated and approved a plan to send a humanitarian aid worth USD 8 million to North Korea at the request of an international organization under the United Nations. The South Korean government also invited North Korea to participate in the 2018 PyeongChang Winter Olympics, which it accepted. Such a reconciliatory mood led to the 2018 Inter-Korean Summit, paving the way for a denuclearized Korean Peninsula. It is estimated that there are about 10 million family members separated by the Korean War. Since the 1970s, South Korea and North Korea have attempted to hold reunions for war-torn families through inter-Korean Red Cross meetings. The two Koreas held Red Cross talks intermittently, including the first meeting in Pyeongyang in August 1972 followed by the second meeting in Seoul in September that year, but ended up suspending such talks after continuing controversy. The two sides resumed the meeting in the 1980s, and, finally, reciprocal visits materialized. A group of thirty people from the North paid a visit to the South while a group of thirty-five people from the South paid a visit to the North for four days from September 20, 1985. It was a truly significant event after 40 years of division. The two sides also allowed exchanges between groups of artists during the event. The family reunion became a routine event following the Summit held in 2000, and was subsequently held on twenty occasions between August 2000 and October 2010. The North provided a special venue at Geumgangsan Mountain for these reunions. In addition, video reunions were carried out on seven different occasions between August of 2005 and November of 2007. Although such reunions have not taken place since the last event at Geumgangsan Mountain in 2015, the two Koreas are now considering holding various exchanges among divided families including the resumption of the August 15 family reunions as agreed in the Panmunjeom Declaration. Gaeseong is the third largest city in the North after Pyeongyang and Nampo. The city offers clear advantages to businesses from the South due to its close geographical proximity to the South. Gaeseong is only 8km from Panmunjeom. The Gaeseong Industrial Complex, the signature project of South Korea’s Sunshine Policy, allowed private businesses from South Korea to build factories on land leased by North Korea for 50 years for the production of goods by domestic and foreign firms. Construction began in 2000, and companies started their operations in earnest from 2005. At one point, more than 120 manufacturers from South Korea employed over 50,000 North Korean workers. The project was regarded as a good example of inter-Korean economic cooperation as the complex was operated with the capital and technology of South Korea, and the labor force of North Korea. Afterward, North Korea’s continued nuclear tests frayed bilateral ties, leading to the withdrawal of South Korean companies in February 2016. However, the recent thaw in inter-Korean relations is raising hopes of the reopening of the joint industrial complex. Concerning the Gaeseong Industrial Complex, the two sides have signed four agreements on the Normalization of Gaeseong Industrial complex, etc., in addition to the agreements on communications, customs clearance, quarantine, and stay. Since the July 4th South–North Joint Statement, the two Koreas have made efforts to improve relations by signing various agreements including the Agreement on Reconciliation, Non-Aggression, and Exchanges and Cooperation between South and North Korea; the Joint Declaration of the Denuclearization of the Korean Peninsula; the June 15 South-North Joint Declaration; the Agreement on the Creation and Operation of a Joint Military Commission; and the Agreement on the Establishment and Operation of the South–North Liaison Office. As the confrontational relationship came to an end with the Panmunjeom Declaration, the two Koreas are mapping out new economic plans for the Korean Peninsula through various inter-Korean exchanges including the opening of the second Gaeseong Industrial Complex. The government of the South has made efforts for a permanent settlement of peace on the Korean Peninsula and the development of good relations with the North through dialogues and exchange and cooperation. It has stuck to its basic stance, i.e. it will continue to strive to improve its relations with the North through dialogue and cooperation even during periods of extreme tension such as that occasioned by the North’s temporary closure of the Gaeseong Industrial Complex. Generally speaking, the government of the South and the South Korean people have succeeded in maintaining a calm and stable social atmosphere. The South copes flexibly with all outbreaks of tension on the Korean Peninsula by continuing dialogue and cooperation to maintain peace with neighboring countries. As such, South Korea may be claimed to be one of the safest countries in the world. The Moon Jae-in administration, which was inaugurated in May 2017, has strived to improve inter-Korean relations, settle peace on the Korean Peninsula, and lay the groundwork for future unification by building mutual trust based on dialog and cooperation. In particular, the Panmunjeom Declaration signed on April 27, 2018, which reaffirmed the goal of completely denuclearizing the peninsula and building a peace regime, has been supported by related countries and the international community. The government of the Republic of Korea, together with North Korea, will continue to accelerate the joint development of the two Koreas and to solidify the foundation of peaceful reunification. To this end, South Korea and North Korea are discussing current issues through regular talks and a direct communication line to build trust with the ultimate aim that a unified Korea will contribute to the peace and prosperity of the region and the world.